Scientists found a single dose of the protein Hi1a worked on lab rats. They said it showed "great promise as a future stroke treatment" but had not yet been tested in human trials. The Stroke Association said the research was at its early stages but it would "welcome any treatment that has the potential to reduce the damage caused by stroke". "We regularly collect spiders from Fraser Island off the south coast of Queensland," explained lead researcher Prof Glenn King. 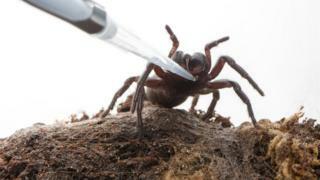 "The reason for this is that funnel-web spiders dig burrows that can be as deep as 20-30 cm. Thus, digging them up from hard clay soils is very difficult. Fraser Island is a sand island which makes it easy for us to extract the spiders from their burrows." The team then took the spiders back to their laboratory "for milking". Image caption Researchers say the protein "provides exceptional levels of protection for eight hours after stroke onset"
They found that the protein blocked acid-sensing ion channels in the brain - something the researchers say are key drivers of brain damage after stroke. Prof King said the protein showed "great promise as a future stroke treatment". "We believe that we have, for the first time, found a way to minimise the effects of brain damage after a stroke. "Hi1a even provides some protection to the core brain region most affected by oxygen deprivation, which is generally considered unrecoverable due to the rapid cell death caused by stroke." "My lab is interested in developing drugs for human nervous system disorders. Many of these disorders involve either dysfunctional ion channels (e.g. epilepsy) or over-active ion channels (chronic pain and stroke). Thus, we are typically looking for molecules that modulate the activity of ion channels. The venoms of small venomous invertebrates such as spiders, centipedes and scorpions have evolved to target the nervous system of insects, and consequently they are absolutely full of ion channel modulators. Because the human nervous system is more complex and wired differently to insects, ion channel modulators that kill or paralyse insects can actually be beneficial to humans. Thus, looking in venoms for ion channel drugs is not as weird as it seems." Dr Kate Holmes, deputy director for Research at the Stroke Association, said: "We do not have an accurate picture of what happens in human brains from this research, therefore, it is currently unknown if this could be a successful treatment option for humans in the future. "We welcome any treatment that has the potential to reduce the damage caused by stroke, particularly if this can benefit people who are unable to arrive at hospital quickly. "Current treatments must be given in half this time period, and it is too early for us to know if this research can offer an alternative for stroke patients. "We urge for stroke to be treated as an emergency - the sooner a person can get to hospital after a stroke, the sooner the right treatment can be received, which can improve survival and help recovery."